The night was a long one. Not in the number of hours we spent shivering as we tried to sleep, but in those countless seconds which lay in between the time we hit the sack and when we pulled ourselves out of it. It was amazing how things seemed to drag and come to a complete standstill when there was something big and important around the immediate corner. Varun however slept a peaceful sleep after a while. I didn’t. I couldn’t. I never have before the big night. The deep and dark labyrinths of my mind were full of vivid dreams, flashes, long endless tunnels, high mountain roads, empty spaces and vacuums. I can’t recollect how many times I would have tossed and turned, changed positions, blown out wind from my mouth in a desperate attempt to breathe and stay afloat. The nostrils were blocked. The cold wouldn’t give way. Even resting my head higher against the wall didn’t help. I woke up many times with a jolt and looked around in the dark. It was still and dark outside. Thankfully the weather hadn’t turned for the worse. Not until now, atleast. The Tiger was yet asleep. I made numerous attempts to yawn and feel tired. But it just wouldn’t work. I flicked the switch of my head torch to see the time. It was only 11.30 pm. I still had 3.5 hours to consume. The call time for breakfast was 3. Departure would be sharp at 4 am. With nothing to do, I sank into the bag once again. 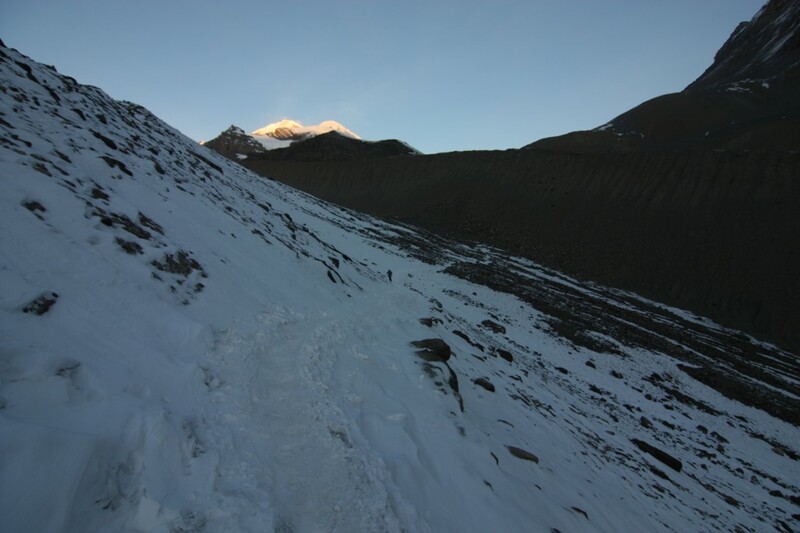 Knowing fully well, that all the preparations over the last 6 months would eventually boil down to these last 3.5 hours of the climb, through the dark of the cold night. Somewhere, sometime I had fallen asleep drifting in and out of my dreams and the sounds and voices which went along with it. I couldn’t be sure if these were in my mind or were they outside of it. I heard accentuated sentences, words spoken, opening of doors and the creaking as they shut, bags being ferried away, gentle footsteps as they moved further and further from me. Narrow beams of light cut through the darkness lighting the path ahead, hushed tones that breakfast was served. What was happening? Where was everyone heading to? Shouldn’t I be going as well? I stretched my legs within the bag and felt my quadriceps and calfs go taut. The eyes opened trying to figure the coordinates and bearings. I was yet in the room. What time was it? A quick check revealed it was 3.15 am. Damn. We were late. The voices and sounds I had heard weren’t in my dream. They were of our fellow inhabitants, who had gotten ready and had already made their way for breakfast. “Varun, wake up. We need to move”. Varun groaned and groggily got up. The room outside of the bag was cold. The boots were cold. The clothes were cold. Damn. This was the worst part of the mountains. Everything was cold. I struggled to put my boots on. Had my feet swollen? Had they outgrown the boots? I felt like Captain Haddock in the monastery in Tintin in Tibet. We were in the dining mess by 3.30 am. There was a flurry of activity inside. The kitchen fires were blazing in full gusto. Different orders were being cooked. The kitchen boys who served the guests would walk out in short intervals and shout the numbers of the rooms. # 21, # 5 etc. and deposit the bowls and plates of porridge, fruits, Tibetan bread and eggs to those who had ordered them. KB had already ordered our porridge. We waited to devour them. We would need the energy. Soon it was time. One after another the various teams headed out of the lodge door into the night, not looking back, never to return. We would do the same. 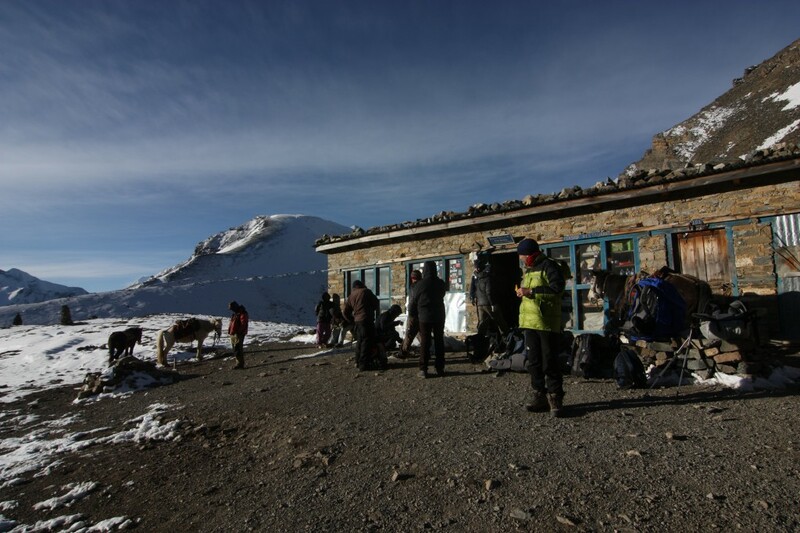 We were all transit passengers passing through multiple mountain terminals to climb to our next destination. Varun and I were finally ready to make the push. Hoisting our bags on our shoulders, we bid farewell and said our thanks to Kumar for the excellent time we had the previous evening. He wished us the best and hoped our paths would again cross someday, soon. We hoped so too. I pushed the door open and walked out. The night was clear, with dazzling stars which were so close, and as far as I could see and a very bright moon which cast its light over the jagged terrain around us. There was just a hint of a breeze which cut through this settlement. Far above me I could see a meandering line of slow moving bobbing lights. Sometimes visible. Sometimes not. That’s the direction we had to head towards. “KB, let’s start, shall we?”. “Yes Saheb, you start and I will follow”. So this was it. The final stretch. Varun and I commenced our climb. I hadn’t slept well the night before and I could feel the tiredness running through the body within the first 30 minutes. I let out a few yawns and admonished myself for it. This wasn’t the time or the place to feel sleepy. I was slow of the blocks. Varun and KB were ahead of me by now. Lakhpa with his 40 kg load was somewhere ahead as well in the dark. We couldn’t see him. First a set of 50, then another set of 100, then 150 and then 200 steps, I kept increasing the number of steps I climbed as I felt the engine’s pistons now chugging along smooth in full flow. The insides had warmed up and I was building a rhythm. The porridge was aiding the process of generating energy. I had to stop many times in between however. The French in their single file blocked my way. Trying to overtake them wasn’t an option. The trail was narrow and we had to walk one after another. We had no clue what lay in the dark expanse on the left and the right of the winding trail. If the line stopped, it meant a blockade. And together with that, the endless wait in the dark with the body cooling down and trying to figure what was holding everyone up? Why weren’t we moving? This was most irritating. But thankfully this wasn’t the case for the entire ascent. Just the initial section. Within an hour and 15 minutes of a circuitous and a steep ascent we reached what looked like a natural gateway. Two blocks of mountain rock on either side stood in front of us and we had to make our way through them. It was 5.15 am. The sky had gently started brightening up. From jet black to gentle shades of light blue. The horizon looked like it would brighten up first. As soon as we had crossed this gateway the roof of a lodge appeared. 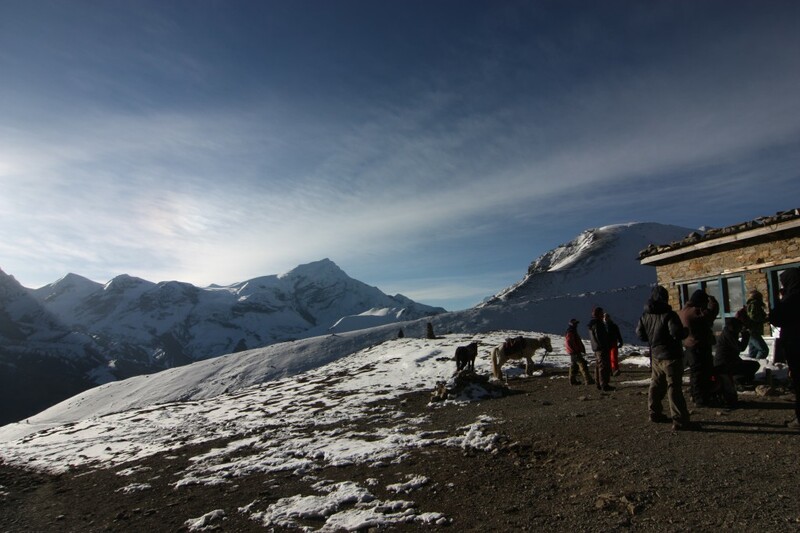 This was the Thorung High Camp. It already had multiple teams thronging it. We stopped here to rest a bit but very soon we were on the way. The cold was biting and so was the wind. I had to cover my face and breathe through the fleece mouth piece. It felt uncomfortable but I clearly had no option. The down jacket felt heavy too. The senses had to keep up with the external environment and the gear on the body. Together with this I had the camera in my hand. I decided to stuff it inside the bag and focus more on where I was walking. The trail was full of snow and this felt slippery. Each step had to be firm unless I intended to take a tumble down the snow covered faces of the slopes we were on. It slowed me down. KB, Varun and I had split up as well and we were a fair distance apart from each other. Though we were in sight, it was each man to himself. Amongst the ice capped peaks. Notice the horizon. Our surge continued, down one slope and up the next. Down another one and up yet another. There were flat stretches in between. But these were few and far between. 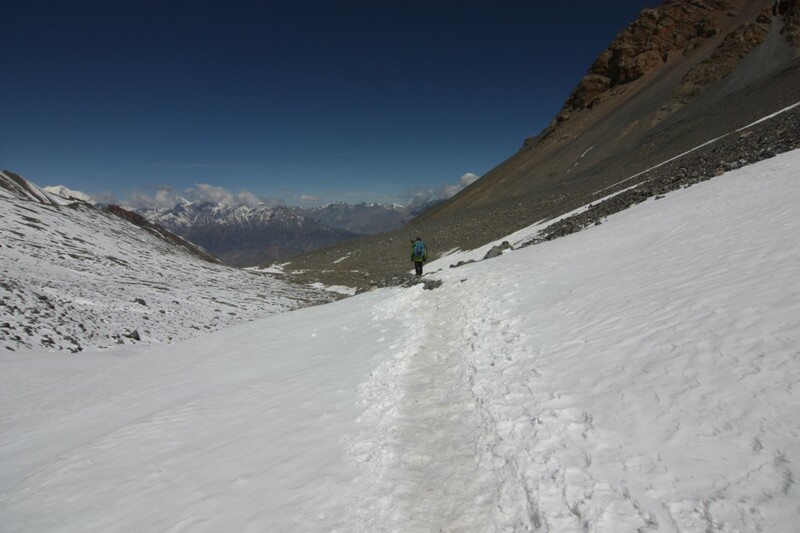 On one such slope, I noticed a Sherpa guide walking hurriedly towards me leading a young woman by hand. As we crossed each other, and I stepped aside putting my full body weight on my left at an angle, I observed the woman’s face. She was in lot of discomfort and looked like she’d collapse any moment. She clearly had no energy left and no mental strength either to continue. I knew these symptoms. She was hit by altitude and was suffering from acute mountain sickness, popularly known as AMS. A bad state to be in. She had to descend. There was no other option. The best place for her would be Thorung Phedi, not even the high camp we had crossed. It reminded me of my own AMS experience in 2003 when I had gone to summit Stok Kangri, a 20162 ft peak in Ladakh, India. It was excruciating. I couldn’t keep my eyes open, tears rolled out from them, I was nauseated, couldn’t eat and had a sharp and shooting pain through my head which was unending and refused to let up. 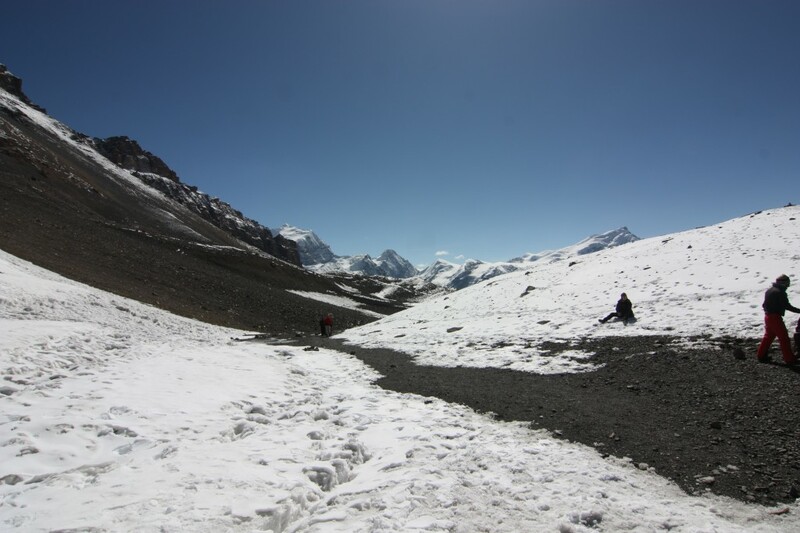 My journey had virtually ended even before I had reached the base camp of the mountain. I had been asked to turn back, descend and head back to Leh, the capital city of Ladakh. It was an ignominious defeat, considering the others in the group went up, including many first timers like me. I was young, naive and the ego had played a dominant role in my immediate reactions against the team leader and my good friend Jayesh Morvankar. It took me 2 years to get over that ‘failure’ and when I had completed the Kanchenjunga journey in 2005, I felt relieved. Well somewhat. 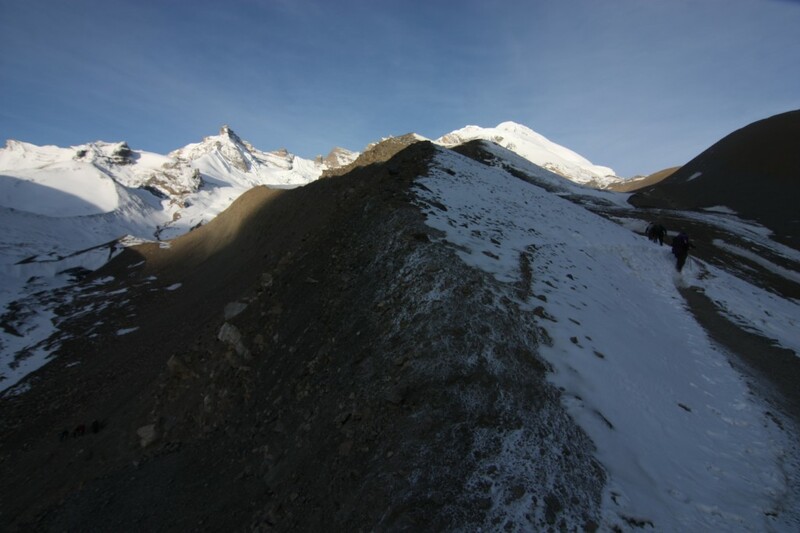 Stok Kangri still remains a part of my list of summits which I intend ascending someday. The proportions around us meantime were getting bigger with every passing descent and ascent. And this became very apparent when I saw the next ascent across me on the other side. 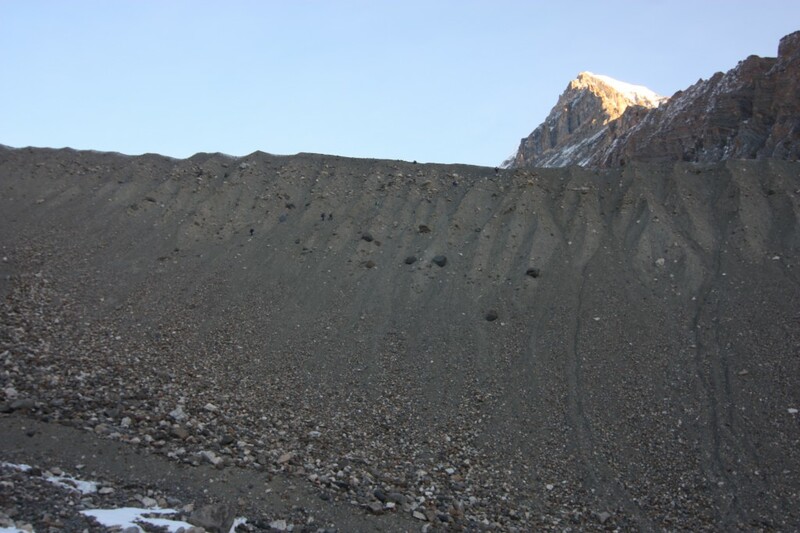 As I descended from the snow covered face of the slope I was on, I saw a brown slope full of loose gravel and stones. I could make out what seemed like a thin strip of a diagonal rising trail. A team of 3 steadily made their way up. But they seemed tiny and had completely blended in with the colour of the face. It was difficult to spot them and I saw them only because I looked hard at the terrain ahead. We were so insignificant compared to the scale of our surroundings and were increasingly getting dwarfed. Proportions going awry. Dwarfed by nature. Rounding off the corner of this brown hill, I was exposed to snow and ice over an extremely vast undulating stretch. The width and the length would have been many miles over and I wondered how much it was. Snow continued to cover the path I walked and ice covered the peaks around me. The sun had also gained intensity and brightness which was both alarming and uncomfortable. I wanted to strip down to my bare minimum. If only the cold would allow me to do so. Nonetheless we continued. Each of us lost in our own private world of hopes and dreams, of thoughts of back home and of the present, of the ensuing physical hardship and of the comfort of a lateral position in a sleeping bag, of pangs of hunger and of easy access to hot soups, lemon teas and warm popcorn. It was quite a cocktail of contrasts that kept me mentally occupied. The other side of the brown hill. Start of the vast undulating icy terrain. The harsh environment refused to subside. But hey, in front was a singular lodge with horses tied near the entrance. This would be a good place to stop, get a breather, sip water and soak in the scenery. I reached out and grabbed the nozzle of my hydration pack and sucked hard but to no respite. “KB, can you see what’s the problem?”. He walked up behind and after giving it a close inspection, said “Saheb, it’s frozen”. Damn. The exposed part of the pipe had iced up! The last sip I had was before the Phedi high camp and I was thirsty. 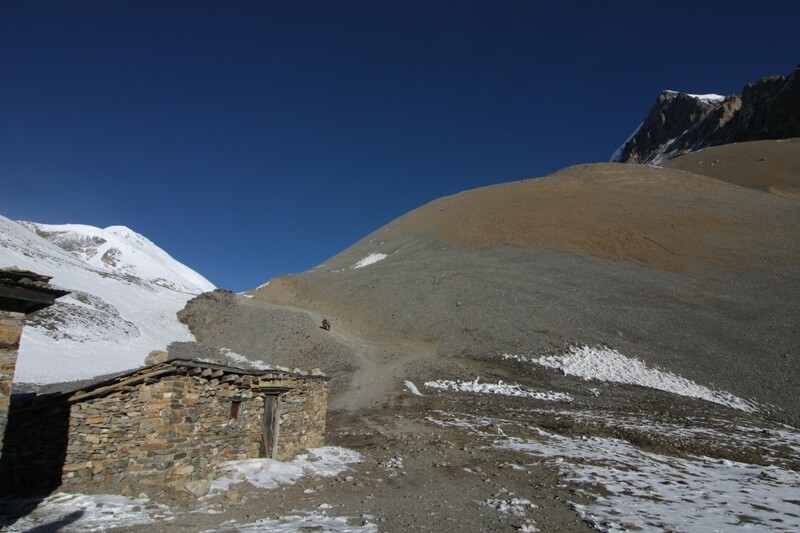 The only solution was to reach Thorung La at the soonest and descend to Muktinath. The ice would hopefully melt by then. Taking just one small gulp from KB’s bottle to moisten the throat, I resumed the trudge. When on the trail, you have to be independent and not depend on your colleagues for resources. If you do that, you risk finishing their rationed supply as well. It’s tough but practical and necessary. What was the temperature we had been walking through, I wondered? Varun’s dangling temperature gauge on his bag revealed -6 degree centigrade. But it didn’t feel like that thanks to the relentless heat. Going up yet another slope and seeing the terrain continue the way it had thus far was deflating to the mind and spirit. It wasn’t for the number of hours we had walked, but the need to escape this endless terrain. It kept coming hard at us laced with cold winds and a harsh and a blazing sun. The terrain reminded me of the stretch from Lobuche to Gorak Shep on the Everest Base Camp trail. That was sheer unending torture. After sometime it got amusing too. One gigantic mound after another. They just didn’t stop. What that experience didn’t have however was the wind chill. Eventually we did reach Gorak Shep. And I knew we would reach Thorung La too. So we just had to keep at it. I looked behind and saw KB closely trailing Varun. I couldn’t be sure, but the morning’s journey seemed to have taken its toll on the Tiger. He was on auto-mode and walked slowly. Were his knees buckling up? Giving away? His face seemed red the last I had seen him, which was probably due to exhaustion. Maybe that’s why KB was bringing up the rear? But I knew Varun would pull through easily. He was experienced and was perhaps pacing himself like he had done so far on the trail over the last one week. After about 3.5 hours approx of this unending climb, sometime between 7.45 – 8 in the morning I finally saw prayer flags on the horizon and knew this had to be it. We were finally approaching the mighty Thorung La. The spring in the tired steps was electric. Where and how did I manage to draw out this extra energy? It would be but a matter of minutes before I would stand there taking photographs. I swiftly crossed a team of 4 elderly Australians walking in a single file led by an energetic gentleman in his late 70s whom I can still remember. He seemed wonderfully synced to his walking rhythm. This was a joy to see. The last few steps onto the elevated patch and I had done it. I was at 17769 ft above sea level. 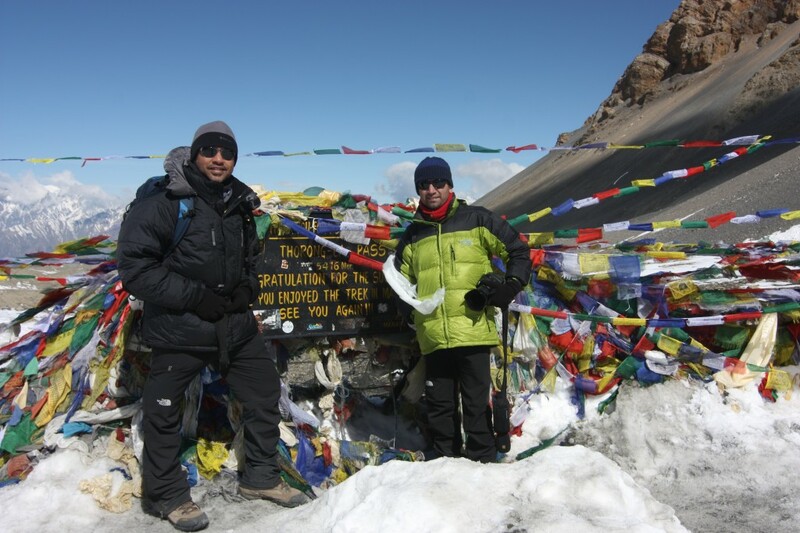 My second 17000 plus point over successive Himalayan journeys. I looked around. The scenery was stark and bare. 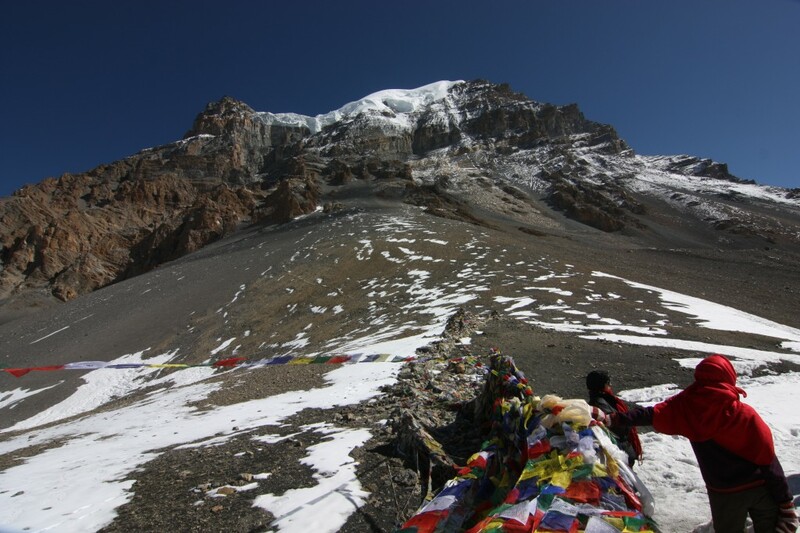 Fluttering prayer flags, cold wind, bright sun, blue sky, ice, snow and rock, hot lemon tea, energy bars, celebrating teams, group snaps. It was a mix of everything. Varun had just walked in as well. Followed by KB. I walked over, hugged and congratulated him for having completed it. We had both been stretched and we knew it. But it was time to celebrate and enjoy the moment. Not too long though as we didn’t want the body cooling down too much. Around Thorung La. 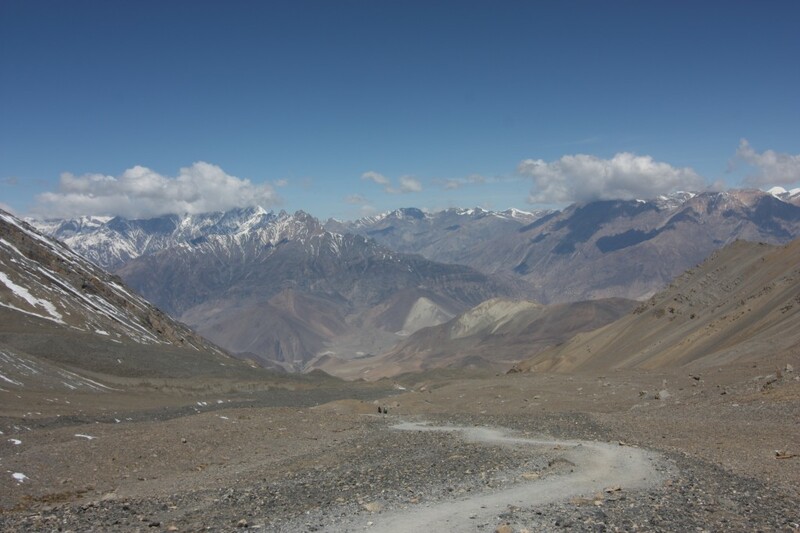 The horizon drops down into Muktinath. With Varun, once he walked in too. The cold wind started irritating me soon enough. In my head this time. 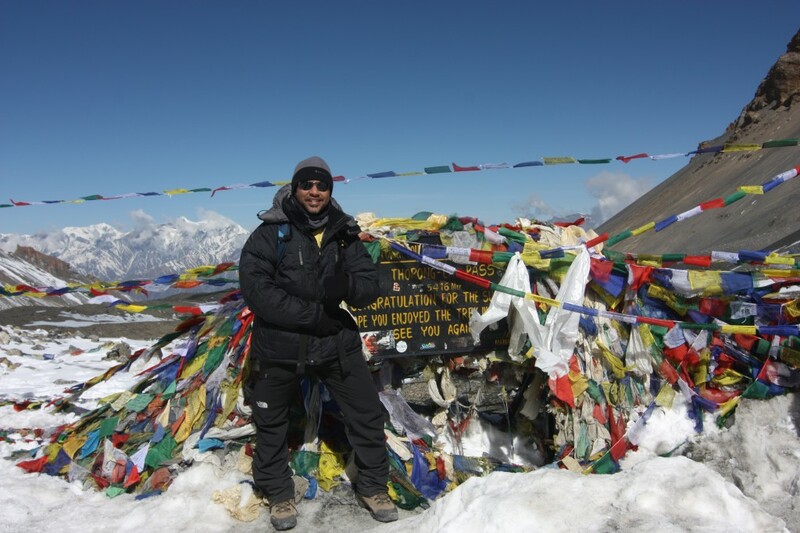 I wanted to exit this summit pass in Central Nepal at the earliest for I was scared I would catch a head cold. We yet had to complete a lengthy descent which we hadn’t even thought of. In the 3.5 hours of climbing since 4 am we had ascended 3500 ft. And we were now due to descend 5500 ft into the Hindu pilgrimage town of Muktinath. It would be big. It would be enormous. It would stretch us even more than we thought it could, then. 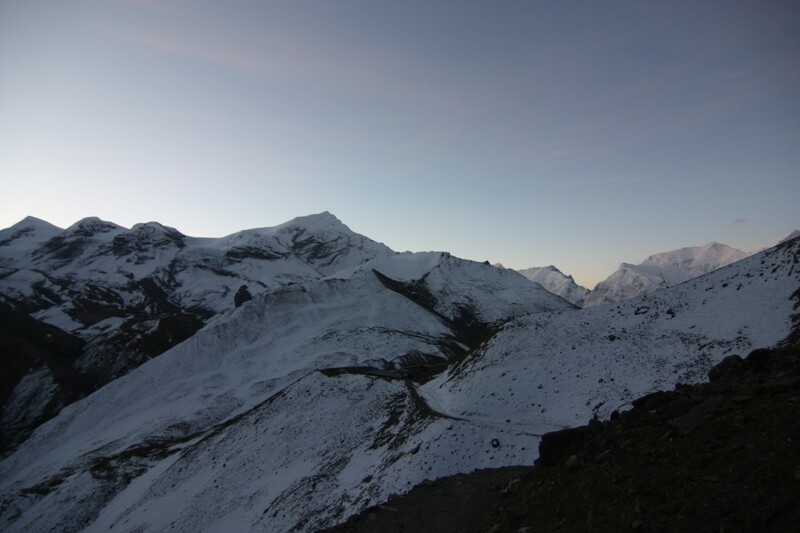 The vast surreal expanse with Dhaulagiri (8167 mtrs/ 26787 ft), the world’s 7th highest mountain on the horizon’s left, lay before me and I could see what I would soon get into. Descents were always full of energy as I enjoyed running down mountain faces. But this one in particular was gigantic and could just be steep as well. 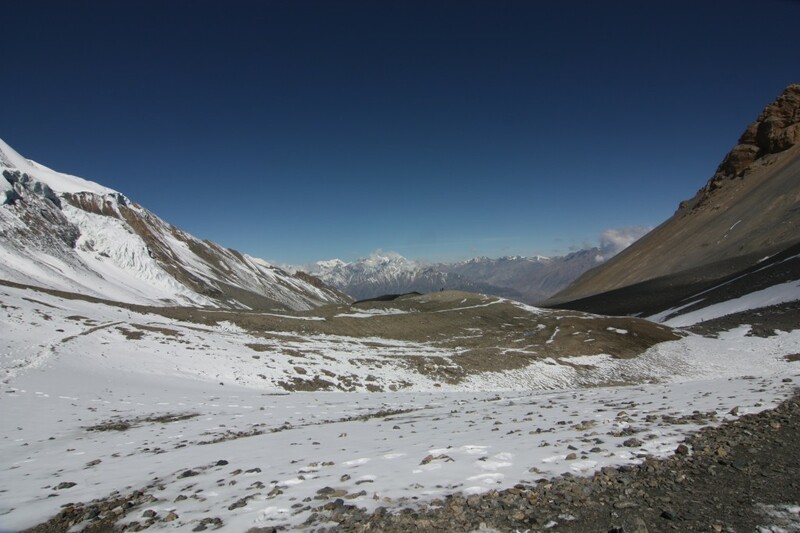 This entry was posted in Events, Latest Journey and tagged Australians, Captain Haddock, Central Nepal, French, Monastery, Muktinath, Summit Pass, Thorung La, Thorung Phedi, Tintin in Tibet. Bookmark the permalink.